When you’re signing up for something called the Gibbon Experience it’s not hard to understand why you might have the impression that you’ll see gibbons. And that’s probably why they tell you it’s really unlikely. Yet, Sasha and I gladly signed up for what has been our most expensive activity to date. Black gibbons are apes with really long arms and relatively small bodies. They live in the third or highest canopy of the jungle and can swing between trees that are 8 meters apart at 30 km per hour. They were thought to be near extinct until 1997 when they were rediscovered in Laos. They remain endangered. The reason they call it the Gibbon Experience is because you get to live in the canopy in tree-houses and fly between trees on zip lines that are as long as 400 meters and can be over 150 meters above the ground. So even if you don’t see one, you get to experience their lifestyle. Sort of. There is also some small chance you’ll see a gibbon. And the whole thing is run to fund gibbon conservation efforts as well as alleviate poverty in the area. In this case living out a childhood fantasy doesn’t come at anyone or anything’s expense aside from our wallet. Getting to the jungle from town involved a 2 hour drive and a 2 hour hike through leech infested jungle. Neither Sasha or I had ever zip lined before, but we were both pretty excited. Our guide, Nushom, a local Hmong villager walked us through the basics using some impressive English he’d picked up by reading the dictionary and an English grammar book. Take that Rosetta Stone. I clipped myself to a cable wrapped around a tree whose other end was completely obscured from view and stepped off the rickety wooden platform. 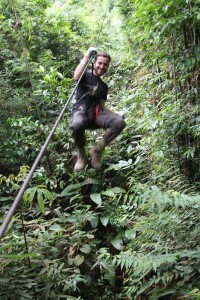 My first zip line was just over 300 meters (almost 1000 feet long) and traversed a huge ravine. As I accelerated the sound of wind rushing by competed only with the whine of the zip line that was reminiscent of a jet engine getting underway. During the few seconds, I spent gliding across the center of the zip line, I enjoyed its most stunning view. I could see jungle for miles – no sign of human civilization. Despite the roaring wind and whine of metal on metal, being suspended from the zip line above the canopy has an almost zen like quality. As I came in for a landing and decreased speed the wind faded away and the zip line lowered its pitch. The ‘high’ is over until you do it again. We lost count of how many “zips” we did in the end, but it was at least 4 or 5 dozen. Sasha took a video of one of her zips. 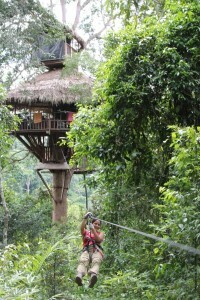 Each night, we zipped to our treehouse, treehouse #3, since that is the only way in or out. It was about 50 meters above the ground and had running water, a shower, solar powered lights, mattresses and a killer view. Late on the second night a storm rolled through with heavy rain, wind, thunder and lightening. High in a tree with a metal roof in the middle of a jungle is a good place to be during a lightening storm, right? The tree we were strapped to swayed in the wind and we scrambled to get our things and selves to the one corner of the tree house that stayed dry. On the morning of the final day, while I was brushing my teeth, we were serenaded by gibbons. They sing to each other as a means of communicating, but sitting in a treehouse in the middle of the jungle with the quiet of the morning around us made it feel like they were doing a duet just for us. Our guide began searching the forest. Then he saw them. About 350 meters away he pointed out their tiny black silhouettes sitting and swinging in trees. At that distance, the pictures weren’t great, but we have a video thanks to one of our tree mates – make sure you have your volume on. After about 20 minutes, they moved to a set of trees that were out of view. Most of the people that visit don’t see gibbons at all so we felt very lucky. We hiked back to civilization that morning sweaty, tired, muddy, dirty and absolutely thrilled with our Gibbon Experience. OMG! I just loved the zip line video, the gibbon video—I think this is the most envious I have been in following your adventures. Amazing. So happy for you. And can’t wait to hear more in person!!! But then again, if I were you I might never come home. Wow, you two, this is absolutely amazing. Thank you so much for all the pictures, the video and the descriptive narrative of this experience. I feel like I got to share in the adventure. What a dream! So happy for you guys. Much love! Thanks. This was definitely a highlight so far. We don’t post the videos of us on 10 hour bus rides. D’oh! I miss you too. We’ll catch each other on the phone soon hope. Amazing experience. You both are fearless! I loved the fog over the tree tops.